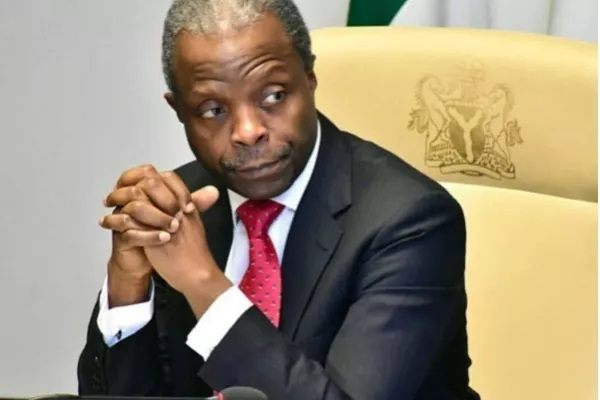 Vice President Yemi Osinbajo has dismissed claims that a photo showing him and former president Olusegun Obasanjo Tuesday did not emanate from a secret meeting between them. The photo, which showed Mr. Osinbajo, the former president, and Rotimi Amaechi, the director general of Muhammadu Buhari Campaign Organization, in a meeting was widely circulated on social media. Several Nigerians opined that the ruling All Progressives Congress (APC) had begun seeking ways to lobby Mr. Obasanjo ahead of the 2019 general election. But the vice president’s media aide, Laolu Akande, took to twitter to say the meeting, which happened at the Nnamdi Azikiwe International Airport, was a coincidence. According to him, there was no secret meeting between the duos. “Ignore reports VP Osinbajo alongside Minister Amaechi held meeting with former President Obasanjo in Ota. “Yesterday, at the Nnamdi Azikiwe International Airport Abuja, on his way to Lagos, Vice President ran into the former President who had just landed. They exchanged pleasantries. Period,” Mr. Akande said. Mr. Obasanjo recently endorsed the opposition candidate, Atiku Abubakar of Peoples Democratic Party (PDP) and is expected to be the main challenger to Mr. Buhari, who is seeking re-election. Mr. Abubakar, as one of his first deft political moves, had sought the forgiveness of his estranged former boss, Mr. Obasanjo, who had earlier sworn not to support his (Mr. Abubakar) years-long aspirations to become president. Recently, Mr. Obasanjo expressed his dissatisfaction with the president, whom he had supported in 2015 to win the election, urging him not to seek re-election because he had performed dismally.